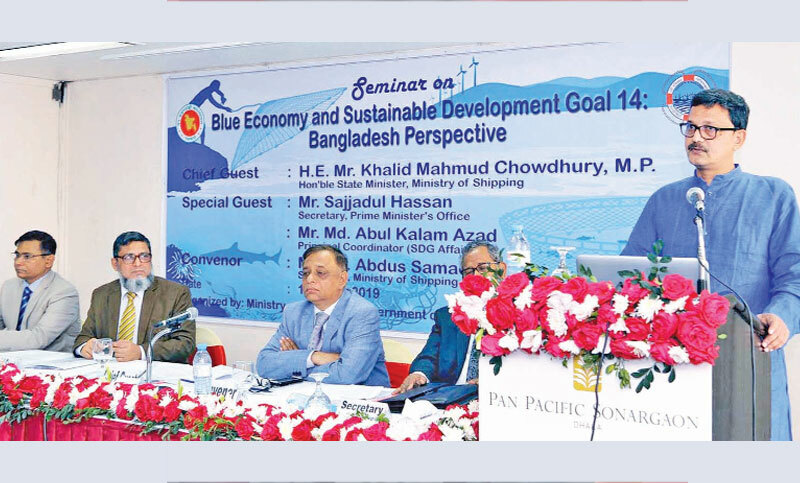 State Minister for Shipping Khalid Mahmud Chowdhury on Thursday said that by establishing a “blue economy” the country would achieve double digit growth by 2025. “The government is working on utilizing the vast resources in the Bay of Bengal to harness the blue economy,” he said. The state minister was speaking at a seminar “Blue Economy and Sustainable Development Goal 14: Bangladesh Perspective” at Hotel Pan-Pacific Sonargaon. Recalling the role of the Father of the Nation Bangabandhu Sheikh Mujibur Rahman in the creation of Bangladesh, the state minister said Bangabandhu endorsed the Law of the Sea in 1974 and his daughter Prime Minister Sheikh Hasina demarcated the maritime boundary, reports BSS. The dream of Bangabandhu will come true if we can use our vast ocean, he added. He said under the leadership of Prime Minister Sheikh Hasina the dream of Bangabandhu is being realised. The Department of Shipping organized the seminar and Rear Admiral (Retd) Md. Khurshed Alam, Secretary of Maritime Affairs’ Unit, under the Ministry of Foreign Affairs, delivered the key-note speech, while Director General of Department of Shipping Syed Ariful Islam chaired the meeting. Shipping Secretary Md Abdus Samad and Fisheries’ and Livestock Secretary Md Raisul Alam Mondal, among others, addressed the seminar.